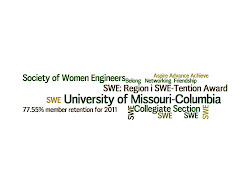 Mizzou SWE cannot wait for a new start to the 2016-2017 school year! Start Fall Semester Off Right With SWE! Well, it's another year here at Mizzou with the SWEetHearts! No matter whether you're a freshmen just getting started or a seasoned senior, we have lots of ways to get involved! We will be having a welcome event in the Rollins Classroom on Thursday from 5:30-7 PM. You can meet new people, eat some yummy snacks, and possibly get a free T shirt! WUT WUT! Leadership team, don't forget about our retreat on Tuesday, in the civil engineering classroom. Have a great first week of classes! This Friday 9/28 Join SWE and NSBE at Shryocks Callaway Farms for the CORN MAZE!!! There are many activites to do at Shryocks: live- size corn maze, group hayrides, roaring campfires, and the list goes on. This year's maze features Truman and Mizzou's move to the SEC conference, it's going to be an adventure! The cost is $7/person and we will decide what will be the best time to leave on Friday. The time frame will be around 5-7pm leaving in front of the engineering building. EMAIL Traonna Clark: TDCMB7@mail.missouri.edu by TOMORROW (Wednesday) @ 5pm if Interested!! This will be a great time, you don't want to miss out! !